Well today is my last day in Cornwall as tomorrow I head for South Wales. After a breakfast of Eggs Royale I set off and I headed for Siblyback Lake which is near the B&B I am staying then up the road a mile or to to the Hurlers. Bronze Age Monument (c.1500 BC) consisting of three stone circles in a line. The southern most circle is incomplete, but the other two have been restored. Two standing stones, ‘The Pipers’ lie to the west of the site. While walking over the hill and taking in the 360 degree view of Cornwall I decided to visit Tintagel and Padstow. The weather was fine and sunny with the odd cloud overhead, the temperature only making about 15 but pleasant. 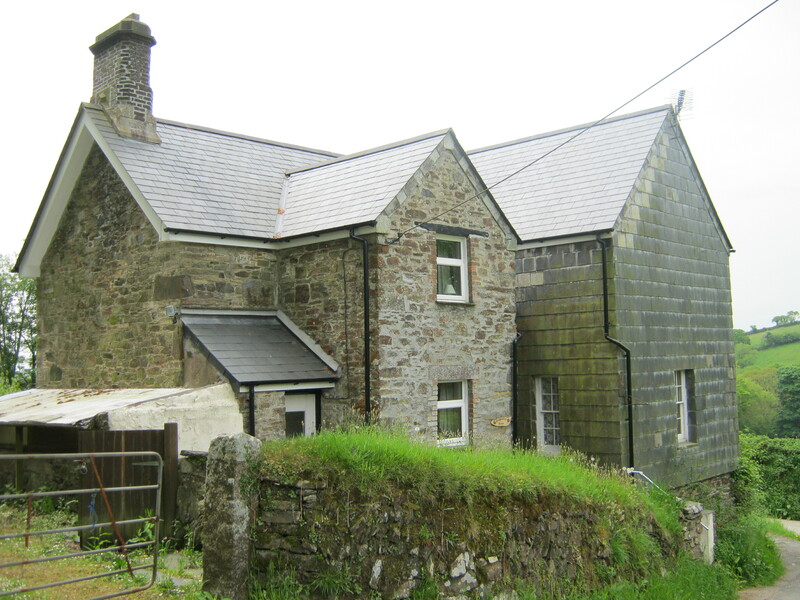 Arriving in Tintagel I found the Old Office which is a 14th-century stone house, built to the plan of a medieval manor house. Well that was the easy bit. The next bit was to visit the Castle reputed to be the birth place of King Arthur. 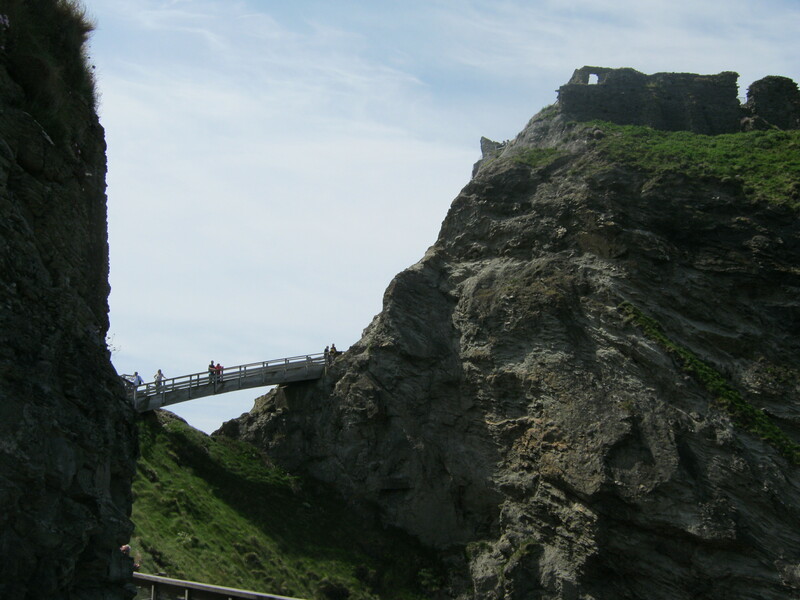 Tintagel Castle is set on a dramatic and picturesque headland that is virtually an island, connected to the mainland by a slim finger of land. To get to the castle, which very little remains, you have to walk down a valley, cross a small stream then ascend what cliff face traverse a narrow land bridge to the island then continue ascending a cliff face to the castle gate. The descent from the village had me a bit worried as it was pretty hard going down and I knew I would have to walk back up. There is a Land Rover service that will take you down the slope or back up and he was making good money each trip as in was full each time I saw him. At the bottom of the valley is a cafe and shop you can go down to the beach from here or go up to the castle. The National Trust run the site and they have an office just before you get on the land bridge. Luckily the land bridge as been replaced by a wooden one. There are crude steps up the cliff to the Castle Gate. Once through the gate you can roam all over to island with very little in the way of safety equipment just the occasional sign warning of a cliff edge. Everywhere there are remains of building and the coastal views are amazing. After wondering around for some time it was time to head back. I made it back to Cafe at the bottom of the valley and had some sustenance. I sat in the sun eating a tiddy oggy (Cornish Pastie). Armed with a bottle of water I set off for the village and the car. It was a slow arduous journey but I made it to the ice cream shop for my reward. Back in the car it was time to head furthe down the north coast to Padstow. I had checked the net for directions and I was determined to get my fish ‘n’ chips from Rick Stein’s Cafe. I drove into Padstow again but this time I decided to try the carpark down by the Quay as I had done enough walking for one day. I found the cafe on South Quay but it didn’t open till 5pm. I had an hour and a half to kill so off I went walking again. Five o’clock came and back to the cafe and order haddock and chips. 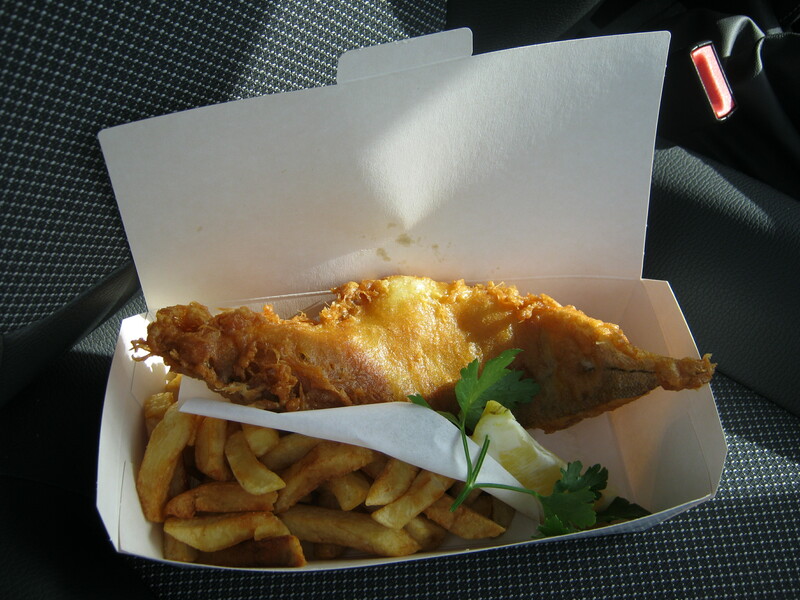 The shop was already packed but after about 15 minutes I had my box of fish ‘n’ chip and back at the car to enjoy. Well it was worth the effort and nothing like the rubbish I brought in Liskeard earlier in the week. 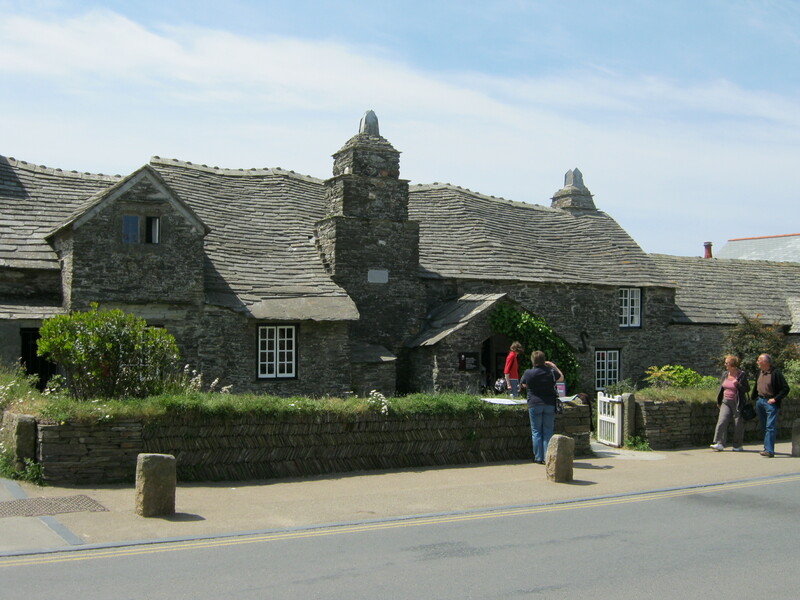 On the way home I dropped in to the Old Jamaica Inn for a pint of cider to end a great day. The morning started with another fine Cornish Breakfast of ham & eggs. It was then time to do a bit on online family searching so I could go back to the Museum in Liskeard and look at the parish register for St.Cleer. Just as I was starting I received a Skype call from Sil in Sydney. He had video on and I didn’t have enough bandwidth in my room so I went down to the conservatory and I was able to speak to him with good quality. After I had finished that call I got one from young Liam. It was great to see him. He is growing well and start his injections this week. He is so strong he was lifting his head and upper body from the floor and the legs were coming up as well. He is certainly doing well. It was great to see and talk to Liam. Back to work and I found some more of the Cowling family of St. Cleer. Armed with some names and dates it was off to Liskeard to look at microfiche. On the way I stopped and took some photos of Lampprettons House and Cottages. They are about a mile out of St.Cleer and this was the address on the Census. I perry sure they wouldn’t have lived in the house but in one of the surrounding cottages. My search of the Parish records made me think my ancestors my be “heathens” as I could not find any records. Then the penny dropped my 3rd Great Grandparents were buried in the General Cemetery which surrounds the Dissenters Chapel and 2 Great Grandparent were married in the Registry hence they wouldn’t appear in the Parish records. Oh no point in looking at microfiche. I took off the South Cornish coast to Looe then on to the fishing village of Polperro. The streets here are very narrow and the fish would have been hauled out by horse and cart. The horse and cart now takes tourists from the car park 750 yards down to the harbour and back (for a fee of course). Tonight I dined out at the CheeseWring Pub at Minnons. Lovely pork ribs washed down by a pint of cider. Lets see what tomorrow brings. At last I have a semi reasonable connection to the internet thanks to mine hosts Clive & Julie ffitch of Redgate Smithy B&B. They provide WiFi as well as a great breakfast in great surroundings. Today I set off to see if I could locate the grave of my 3rd Great Grandfather and Mother. I was able to locate the plot though unmarked in the St Cleer Dissenter’s Cemetery in St.Cleer Cornwall. This achieved I set off for the Church yard in Liskeard to see if I could locate any others. I also called in at the local museum to find that they have the parish records for St.Cleer on microfiche. It was pointless trawling through them if you haven’t some clue to work with and the easiest way in an online search. so that is my homework for tonight. The day was warm and sunny so it seemed a shame to stay indoors doing research so it was off to Bodmin Moor and the Jamaica Inn for a pint of cider “Pear Rattler” Nice drop and I was tempted to stay all afternoon. This is a popular place and while I was there someone flew in in their helicopter for a quick stop then off again. 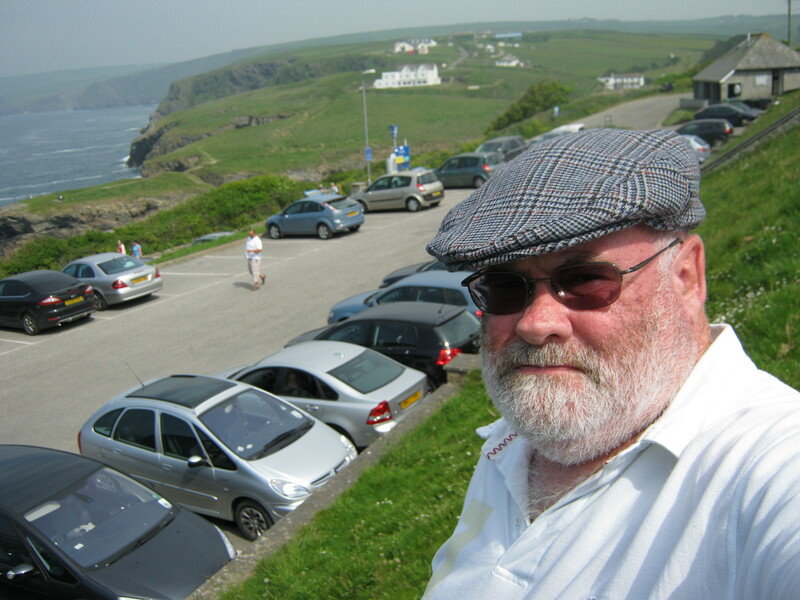 I then drove to Port Isaac, a small fishing village on the North Cornwall coast. This was the setting for the TV series Doc Marten. Then the disappointment. I drove on to Padstow hoping to get Fish ‘N’ Chips from Rick Steins Cafe but I couldn’t find it only the restaurant and the cake shop. So it was time to head back home and sample the delights of the local chippy in Liskeard. I won’t recommend you try it as if was awful. Lucky there is some red wine in my room to wash away the taste.